Some weeks back, Singaporeans reacted to the ‘Unlimited Changes‘ issue which saw a screenshot of a government tender that required vendors to allow “unlimited changes” to the work done. The screenshot, posted by designer Kelley Cheng, saw many creative professionals coming out to speak out against the issue. The Finance and Education Ministries issued a joint statement which confirmed that at least one of the offending tenders came from a local school. According to the statement, the problematic phrases have since been removed from the document involved. We caught up with Ms Goh Shufen, President of the Institute of Advertising Singapore (IAS) and Mr Vivek Kumar. Director of NTUC’s U Creative to find out from them their thoughts about the incident. 1) Was this an isolated case? Or has there been any guidelines or tender standards among government agencies to call for tender? “Based on our interactions with the industry, this is neither an infrequent nor isolated case. From our experience, many creative service buyers can improve on clarity of requirements as well as being more reasonable on pitch expectations. 2) There’s a camp that goes with the view that if you are unhappy with any government tenders, “just don’t bid lor“. What are your thoughts on that? Most creative service providers carefully evaluate the projects that they are bidding for based on their skillsets and the terms of the assignment. Yet, it may not always be feasible or advisable to avoid business from any specific sector. We strongly believe that the service buyer has a responsibility to design a brief which is mindful of both the client’s expectation and the creative effort to meet such expectations. This would also be in the interest of the service buyers in attracting good creative talent to meet their requirements. 3) Do you think it is reasonable for clients (in this case, MOE) to demand unlimited changes? The bigger issue is not only about reasonableness, it’s also about effectiveness. It is in the client’s own interests to be clear on what they want from the creative services provider. Too many changes often suggest a lack of such clarity. The relationship between a client and the creative services provider is dynamic and subjective. Creative professionals try to balance time management and quality work. Some often stretch themselves to maintain their reputation for good quality work. Clients, on the other hand, also have to manage multiple stakeholders internally to ensure that the creative product is aligned with their organisational objectives. It is also not in the best interest of clients to ask for too many changes as it will result in timeline delays. Hence, in better working relationships, both parties are considerate in their dealings, which means respecting timelines, valuing work efforts and balancing administrative processes. 4) There are also comments stating that this is actually a common problem faced by other sectors because “changes” are subjective and clients can argue that the changes are minor changes. What do you think freelancers can do to protect themselves? Everyone should invest more time setting expectations upfront, and as much as possible, have a detailed and specific service level agreement, that is professional, fair and accountable. This is equally important for freelance professionals. The Labour Movement has also published a LawWorks pocket series on “I want to be a freelance professional”, a partnership between National Trades Union Congress (NTUC) and the Law Society of Singapore. You can download a complimentary copy of the pocket series here. If you’re a service buyer, here’s a shout-out to you. 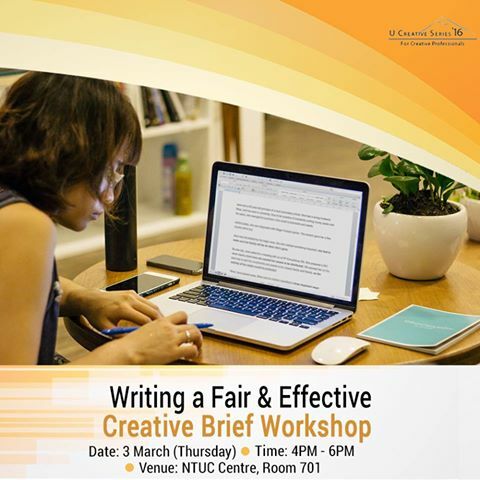 The NTUC’s U Creative, with its online community of over 10,000 creative professionals, is inviting all buyers of creative services to a complimenary workshop to learn all about writing effective and fair briefs to procure creative services.